My son and I made it out yesterday afternoon for a few hours of fantastic, but challenging sailing. As we were pulling out of the slip a dock neighbor yelled over that we were in for a wild ride. I don't worry too much about it because if the lake looks too rough we can always turn around. The channel is always a mess of waves, but usually the lake is much better. We made it out without incident, although we had a few waves we dropped off and witnessed some dramatic bow breaking. The lake had very large swells on it, at least by my standards. I'd say six to eight feet. The period of the waves wasn't too brutal though. I gained an immediate respect for how quickly you could lose someone or something dropped overboard. The picture at right does a poor job of showing the perspective, but the bow was headed down into a trench between waves and about to crash into another one. It was all very predictable, and with some concentration and attention to rudder feedback it was pretty easy to keep the boat doing what I needed it to. In fact, I'm really impressed with how well Ravat handled in these conditions. The CS27 is really an amazing boat in that it feels lively in normal conditions, and yet really stable and predictable in bigger waves. The really interesting thing for me was the size of the waves in contrast to the relatively light winds. 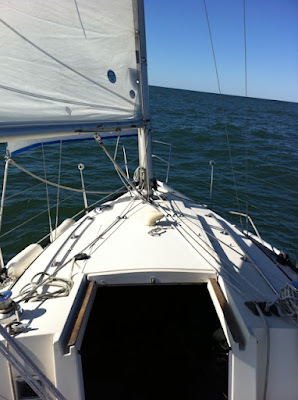 We were probably saling at 3.5 to 4 knots, but those waves were like little roller coasters. Our return trip had some really fun surfing - I wish I'd had the GPS hooked up to see speed over ground. My Little Man, Captain "D" is just shy of his seventh birthday and had his first period of serious helm duty today. He helped me tack by taking the helm while I worked the jib sheets a few times and did a stellar job. He also learned how to keep the boat into the wind while we dropped the main sail. If he were only a bit heavier and stronger he'd be able to trim the sails for me. What really blew my mind was that in this kind of swell he was able to completely zonk out in the cockpit. I had to save him from spilling onto the sole a few times, but he slept for about an hour without stirring. The fresh air and sound of the waves is a kind of tranquilizer that has no equal.